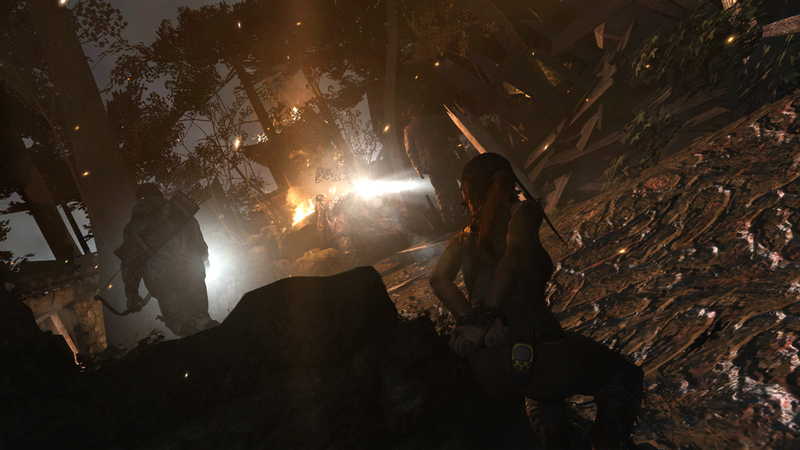 Before she can fight, Lara must learn to survive. I was intrigued by what I saw of Eidos' Tomb Raider reboot at E3 earlier this year, but it wasn't until earlier this week that I was actually allowed to play it. The New York Comic Con hunting demo didn't have much in the way of conflict or combat, but it did show off the new Lara Croft's core struggle: learning how to survive way outside her comfort zone. The demo began on a coastal bluff, with the waves crashing past the remains of shipwrecks below. 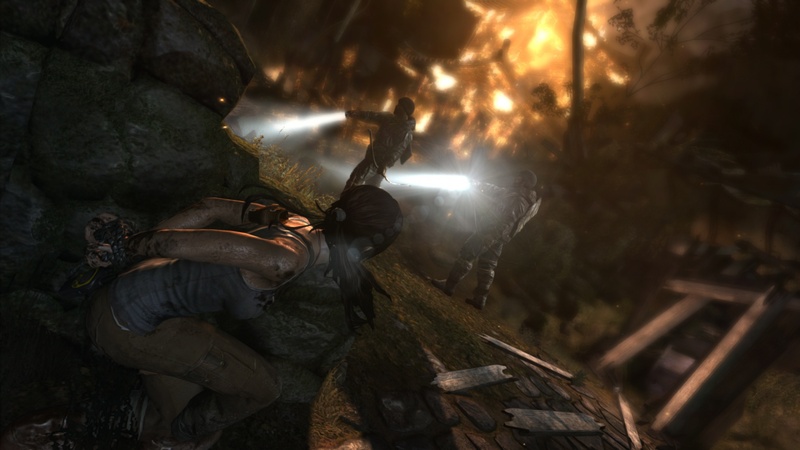 An injured, bloody Lara, having just survived a crash of her own, begins searching for other survivors from her party. 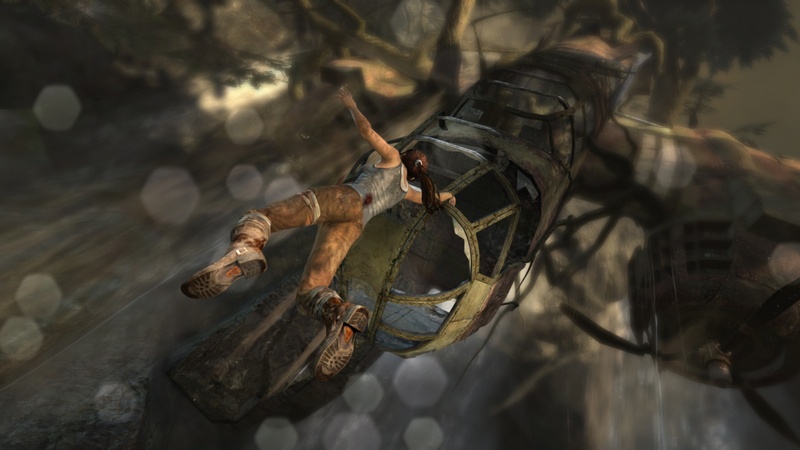 I was able to take control of Lara from the start, and as I explored, I quickly found a wrecked plane suspended near a waterfall. I climbed the plane and made my way across a ledge in a sequence that was very reminiscent of the Uncharted games, which is weird because when Uncharted first came out it drew many comparisons to Tomb Raider. There were signs of life in the wreckage, but no one was present, so the search continued. 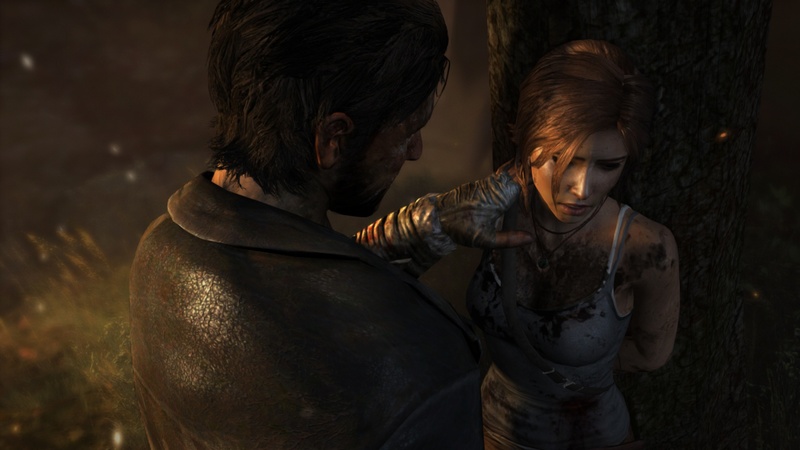 After following the survivors' trail, it began to rain, and Lara was forced to take shelter for the night, using her last match to start a fire. 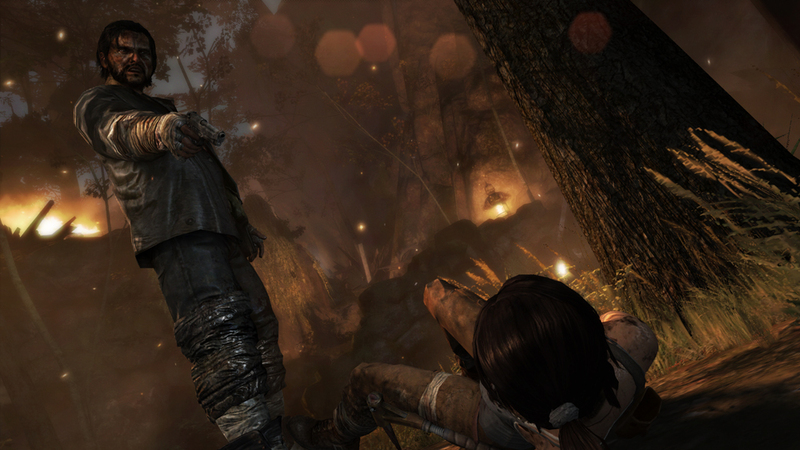 Though I wasn't in control of this sequence, Lara's pause before striking the match conveyed the weight of this action. Shaking from fear and cold, she had to get it right if she wanted to get through the night without freezing to death. Obviously, she's still alive the next morning, and the search for food begins. 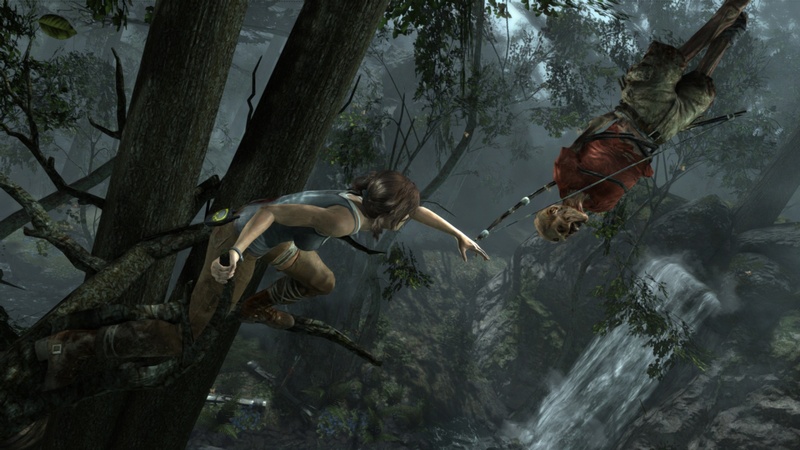 Not far from her camp, Lara finds a corpse hanging upside down from a tree. There's no time to be disgusted, though, because the dead body is still wearing a bow, a crucial tool for hunting. After finding some arrows nearby, I climbed up a ledge, reached for the bow, and grabbed it as the body swung in my direction. After firing off a few test shots, I wandered around until I found what I was looking for: a perfectly innocent deer minding its own business, frolicking through the woods. After trailing the deer at a distance for a minute, I took careful aim and let a couple of arrows loose. 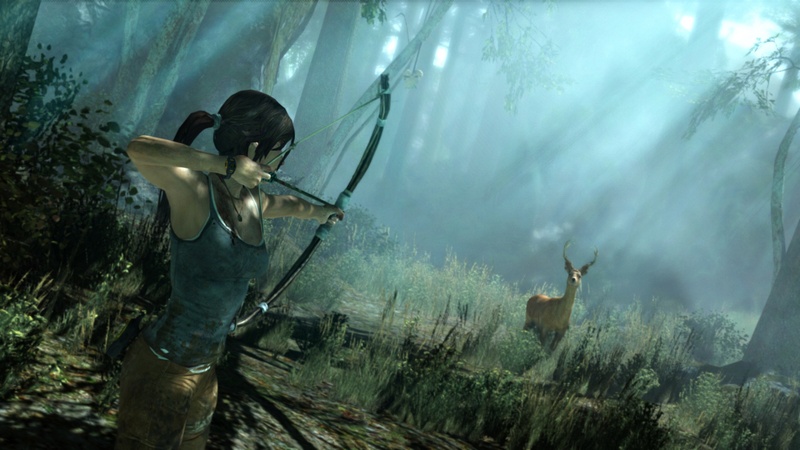 The deer fell, and the game took over as Lara discovered the poor creature was still alive and struggling to breathe. Using an arrow, she finished the job, and I regained control with my new objective being to return to camp with the meat. There are a couple of ways to find your path out in the wild. A map attached to the select button lets you see you, your objective, and any noteworthy features nearby, like bodies of water. You can also set a beacon that lights the way to your next objective while fading everything else into black and white. Back at camp, I got a glimpse at some of the new skills I could unlock with the survival experience I'd gained in my early quest for survival. 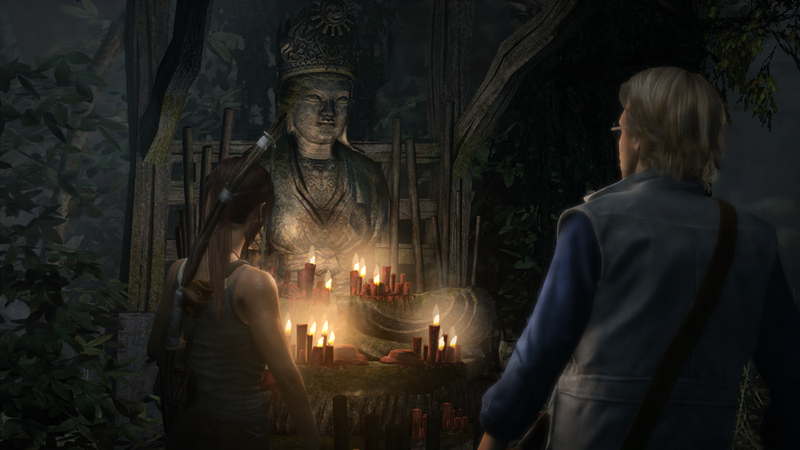 Upgraded abilities like arrow retrieval from fallen enemies, gaining experience from plants and food, and an animal instinct that makes it easier to spot targets are just a few of the survival skills Lara can earn during the course of Tomb Raider. The NYCC demo didn't really show me anything I didn't know, but it was the first time I got to experience what Tomb Raider actually feels like. It's familiar and new at the same time, and I was pleased that I didn't encounter any of the troublesome camera issues for which the series has been infamous. 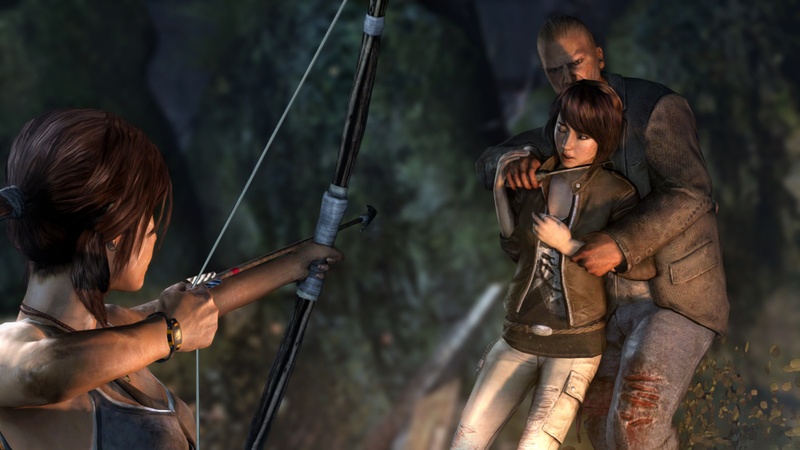 Lara's vulnerability doesn't get in the way of her survival instincts, and there seems to be a lot of room for character development in this reboot. After finally playing Tomb Raider, I'm even more interested in seeing how the shivering, seemingly helpless Lara becomes the tough survivor she needs to be when it launches in 2013.